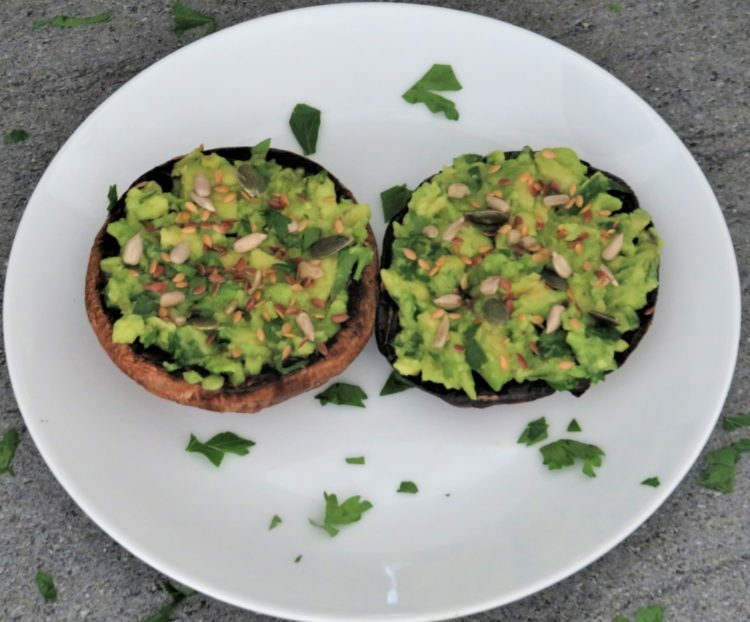 If you love avocados and mushrooms you are going to love this recipe. This recipe is perfect for a weekend brunch breakfast or brunch, as it is quick and easy and will be ready in 10 minutes. 1 Take a dry frying pan, big enough for the 4 mushrooms and place on a medium heat. 2 When the pan is warm, add the mushrooms facing down. Leave to cook for 8- 10 minutes turning frequently until golden in colour and they have softened. 3 Meanwhile, mash the avocados with a folk. 4 When all the avocados are mashed, mix in the the lemon juice. Add the cracked black pepper and parsley, then mix altogether. 5 When the mushrooms are cooked, remove them from the pan and place on a plate. 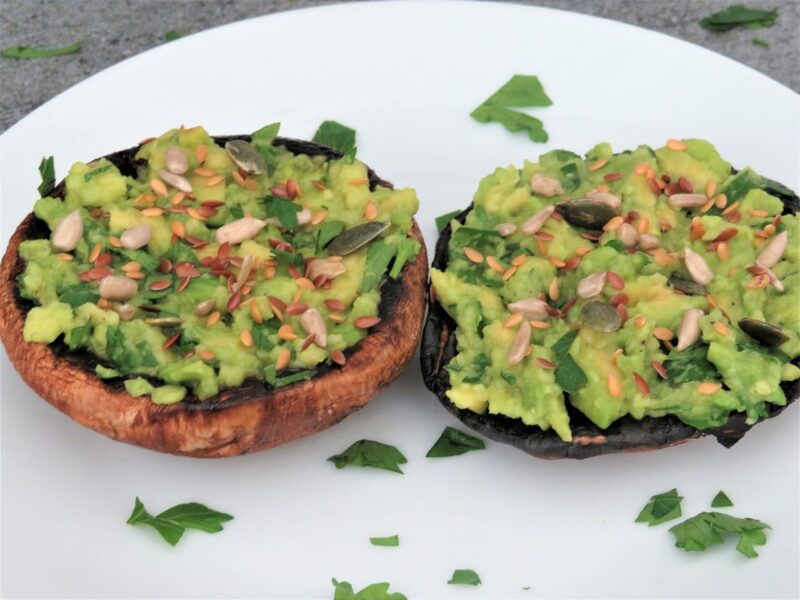 Top the mushrooms with the avocado and sprinkle with the mixed seeds, then enjoy. Mushrooms can slow down the effects of osteoporosis. They are is rich in copper and vitamin-B5. They also contain vitamin-B3, vitamin-B2, selenium important for cognitive function and a healthy immune system, anti-inflammatory, antifungal, anti-tumour properties and antiseptic which help keeps the body free from infections. Avocados are nutrient-dense and contain nearly 20 vitamins and minerals. They are high in fibre, potassium, and copper. They are also rich in vitamin-B, vitamin B-9, vitamin-C, vitamin-E and vitamin-K. They have a low GI, are low in sugar and saturated fats, they also do not contain any cholesterol or sodium. These is what makes avocados a super food. Lemon Juice not only does it cleanse the body of toxins and radiation, it is well known for its antioxidants and anti-inflammatory benefits, it helps strengthen immune system. It is also rich in vitamin-C which has anti-cancer properties, when drizzled on spinach or leafy greens it helps our bodies absorb the iron. Mixed seeds contained pumpkin seeds, sunflower seeds, golden flax seed and brown flaxseeds. Sunflower seeds improve digestion, brain power, the functioning of the cardiovascular system, increase energy levels, strengthen bones and muscles, and are a great skin moisture retainer. They are a rich source of vitamin-B6, vitamin-E, copper, magnesium, manganese, phosphorus and selenium.